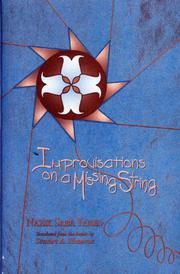  Improvisations On A Missing String ($20.00; paper $12.00; Dec.; 112 pp. ; 1-55728-495-4; paper 1-55728-496-2): A discursive and rather tepid character study of its protagonist, Saada Rayyis, a Palestinian-born woman living in Lebanon who has recovered from a mastectomy and faces more surgery, and who looks back over a life frustrated by the men who exploited, misunderstood, or ignored her, and, before them, by her unloving mother and sister. Saada's story is essentially a paean to the rich (Arabic) culture to which she has been unable to fully belong or contribute, and while her plight alone has its pathos, Yared has made her so emphatically a representative victim that it's hard for the reader to identify with her.